__All hail the N-Strike Elite Hail-Fire, the highest capacity Nerf blaster ever made. With an astounding 144-dart capacity (additional purchases required), this mega blaster holds up to 8 clips of darts, ready to unlease a semi-auto barrage of ammo at your targets. N-Strike Elte blasters are the top of the range blaster from Nerf, featuring upgraded distance performance and the revolutionary Elite Dart, for greater accuracy and flight as far as 75 feet. The unique rotating ammo rack can carry more darts, while the motorised semi-auto mode lets you unload at any target at blistering speeds! When the enemy target is in your sights, pull the Acceleration Trigger to spin the motor up to launching speed, then blast a semi-auto swarm of darts as fast as you can pull the Launch Trigger. When one clip is empty, pull back on the Advance handle to rotate to the next clip and keep on blasting! 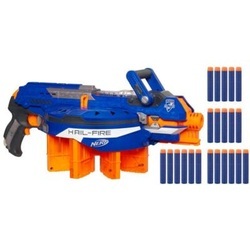 Buy your Nerf Elite Hail-Fire at Amazon.co.uk today! _144 darts - or less? _We love the Hail-Fire's power,but we're not 100% impressed with the upgrade path required to get it to its full capacity. 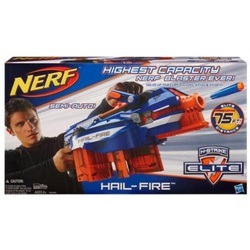 The Hail-Fire only comes packaged with twenty-four darts in four clips. 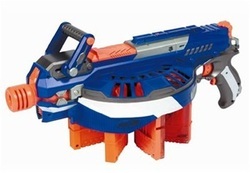 Adding a further six dart clips will give the blaster a full stock capacity of forty-eight darts. • or the the full 144 darts by buying eight 18-dart clips. In effect, the clips the Hail-Fire comes with then become redundant. __Hailfire blaster body, ammo rack cover (2 pieces), Advance handle (2 pieces), 4 Quick Reload Clips, 24 Elite Darts, and instructions. Holds up to 8 clips and 144 darts (with purchase of additional clips and darts). Advance Handle to advance the Rotating Ammo Rack to the next clip. Acceleration Trigger to power up for semi-auto blasting! Upgrade with any Tactical Rail accessory (sold separately). Up to a 75-foot range!